East Rutherford, NJ — Corey Callahan was a major player in the two Kindergarten Classic trotting events at The Meadowlands Saturday night (Nov. 3), an evening that saw four Kindergarten finals for 2-year-olds. 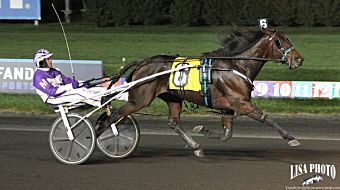 ‘The Captain’ drove 1-9 favorite Seven Hills in the $221,540 colt and gelding trot, but after beginning his career with four powerful wins, the son of Muscle Hill-Southwind Maywood went off stride in the first turn, losing all chance. Reign Of Honor won the Kindergarten Classic for colt and gelding trotters. That opened the door for 7-1 second-choice Reign Of Honor to break his maiden at a most opportune time. David Miller kept the gelded son of Father Patrick-Margarita Momma in a live cover flow, came alongside leader Divine Spirit at the top of the stretch, before powering past that foe to go on to a convincing 5-1/4 length score in 1:55.3. Memo was second with Reve Toujours third. Reign Of Honor, trained by Nifty Norman, returned $17.60 to his backers for owners Deo Valente Farms, Jennifer Dalton Stable and Tom Pontone. Callahan guided an upset winner in the $236,060 filly trot, steering 17-1 shot Stella Jane to victory lane in 1:54.4. Stella Jane and driver Corey Callahan won the Kindergarten Classic for filly trotters. Lisa photos. Tim Tetrick blasted Sister’s Promise away from the gate from post 10 and Callahan went with him from the eight hole. After making the lead at the quarter, Stella Jane yielded to Sister’s Promise and the duo raced 1-2 around the track. Stella Jane vacated the pocket in mid-stretch and rolled to a 2-3/4 length score in 1:54.4. Princess Deo rallied for second with Sister’s Promise holding third. Global Pageant, the 9-5 favorite, went a tough first-over trip, wilted and finished eighth. Stella Jane, trained by John Butenschoen, returned $36.20 for owner Crawford Farms Racing.